In tech Industry "2017" - considered as a memorable year. The industry has seen Massive Equifax data breach to the uber problem, the technology was constantly in the limelight, either with positivity or criticism. However, the enterprise tech, the development were significant. The adoption of AI was greatly adopted and still in continuation. Some time, observing complex trends within a tech ecosystem is quite necessary, as it helps to understand the whole scenario and figure out how the things are moving over time. Future-gazing makes us define educated and informed guesses which allow smart movement. 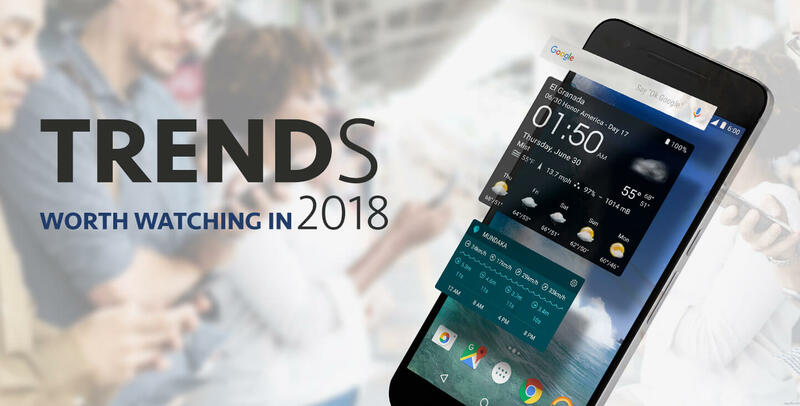 Taking an insightful analysis, we can see how Android App Development is getting popularised as an exploding platform and gradually becoming the most used OS worldwide. In 2017 itself, slowly but gradually, Google was becoming the crucial string for the mobile tech vision of the leading companies. This is the reason, Google has emerged as the main ecosystem. Further, just by concentrating on Google as the main denominator, the mobile app development company can practice over the increased control on user experience. On the other hand, it is expected to transform its software and services, particularly Assistant, dropping the common Android pain points — like disconnected user interfaces, overlapping of too many apps and redundant services, and the inadequate resources most manufacturers devote to ongoing device updates. Missed by the tech world, the Android story has slowly arrived along with Chrome OS - different yet complementary platforms having most of the complementary purposes. The brand new launch of Android-reminiscent launcher and navigation system for Chromebooks clearly indicates the introduction of Google Assistant on Chrome OS and the introduction of Android apps on Chromebooks. This perhaps the beginning of the most transformational move for Android apps on Chromebooks, as the guesses are made that the Google is planning to use fingerprint sensor for Chrome OS. Also, the forecast suggests Android-like support for Chromebooks, including notification replies, secure OS-level VPN connections, multi-tasking capability, a native system and even more. Chromebooks are effectively becoming the new Android tablets focusing on the large-screen computing experience. The next steps of convergence between Android and Chrome OS help to solidify the reality. Android security has always been one of the major concern. In spite majority of the buzz or call it a hype, pushing headlines to create an unpleasant perception of Android. however, there has been a noteworthy focus in Android adoption, particularly when it related to the enterprise. Moreover, Android 8.0 Oreo released a large number of improvements related to security, exclusively designed to keep the foundation for future technologies. In 2018, most of the Android manufacturers belong to the third party have initiated to work on superficial surface-level qualities, hence there will be more obsession for extreme thinness, megapixels maximization, display density. Well, it's surprising that products are moved rather the benefits. This means, there's no software-oriented improvement, therefore Android Mobile App Development Company will incrementally improved new phone models to boost sale. The technology is not confined and as the creativity, hence, its time to focus on the trend. This will help to uniquely implement the development to extract best out of it. The latest Android app development trends all set to hit the market. consider the above-mentioned trends before taking any decision to walk parallel with the advancing technological era.